America, the Great Republic, is holding her elections today. And her voters, you voters, are, uh, still frantically Googling to find out who's running for President. 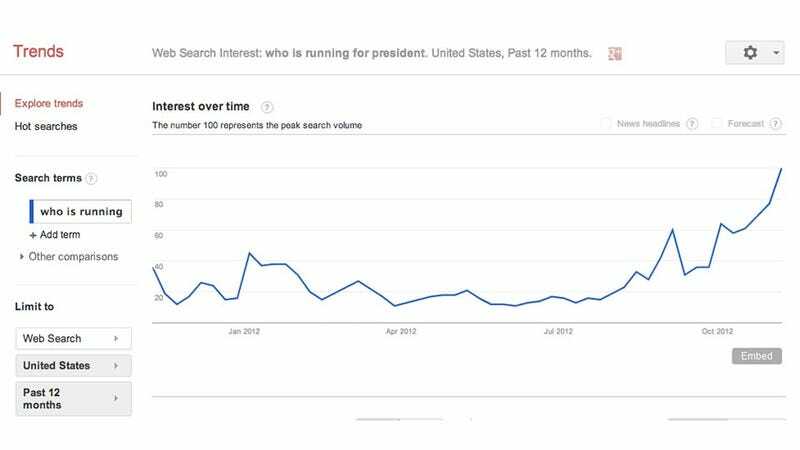 That's a Google Trends chart above, showing how often people in the United States have searched for "who is running for president". As you can see, it's spiked heavily in the past month, and again, higher still, in the past WEEK. The election is today, for god's sake. "Does anyone know who is running for president? I HAVE TO GO VOTE ON IT TODAY." Et cetera.